Soft tissue sarcomas are rare malignancies arising from the mesodermal mesenchyme. These tumors require aggressive adjuvant management, due to their high propensity for local recurrence despite appropriate surgical resection. Brachytherapy offers the ability to deliver highly conformal radiation therapy to the tumor bed while the tissues remain well oxygenated in the postoperative period. 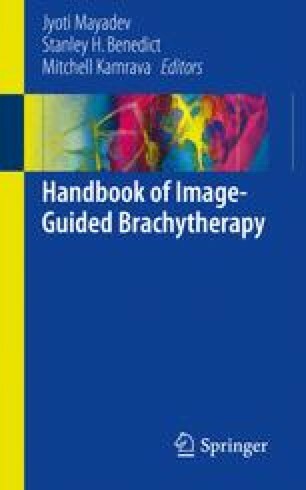 Depending upon the clinical scenario, brachytherapy can be used as monotherapy or in conjunction with external-beam radiation therapy, while both LDR and HDR techniques appear to provide similar outcomes. The use of spacing devices as well as modern wound closure techniques can further improve the timing and delivery of brachytherapy while improving functional/cosmetic outcomes. The usage of preoperative MRI is recommended to delineate appropriate anatomy to guide catheter placement. For treatment planning, MRI simulation is recommended for identification of anatomical boundaries and neurovascular structures, while CT simulation is useful for three-dimensional catheter reconstruction and identification of surgical clips. Therefore, these modalities are best used in conjunction to provide optimal volume-based brachytherapy treatment delivery.